We love to cook, and we love to eat fresh, locally grown food. We began growing our own food when we became discouraged by the quality of produce available in our local supermarket. The tomatoes tasted like cardboard, and the garlic was dry and bitter. As growers, we are able to provide our customers with a variety of foods. Instead of one or two varieties of tomatoes, we will grow five or six varieties of tomato–some early season, which are generally smaller in size, and some varieties that are the perfect size for a tomato sandwich, or a BLT. 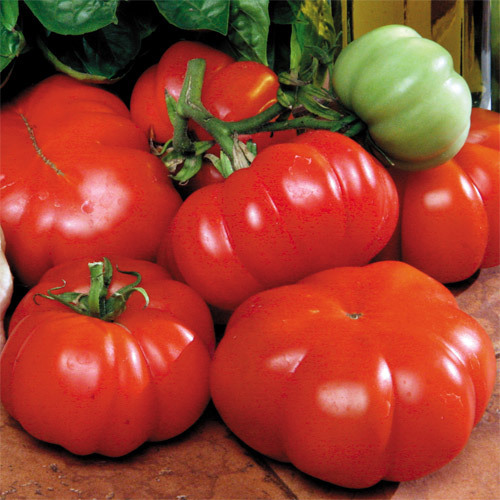 This photo is a Costoluto Genevese Tomato. It is our favorite tomato, and is an Italian Heirloom. In this section, we will share with you some of our favorite recipes from Mallow Farm that showcase our products. .
Do you by chance cell seeds or plant starters of the Costoluto Genevese? I’m just starting into hobby farming. Last year my tomato yield was next to nothing. Jane, I usually have different types of tomato plants and pepper plants for sale at the farm, and at the Farmer’s Market. When our market opens in May, usually what I have on my market table is bedding plants, flowering plants, and all types of herbs in 4″ pots. While we continue to be big lovers of Costoluto Genevese, we have concluded that our market wants large, round, very red tomatoes, and we will not be taking Costoluto as fruit to market in 2017.